In the current market scenario prevailing in Pune, the resale market works best only in ready-to-move properties in high-value locations and locations which are extremely well-connected to the city as well as its IT hubs and manufacturing belt. In a diverse real estate sector such as Pune, it makes sense to study the market carefully and understand where the demand currently is and where it is headed. This identification approach should be two-pronged - in terms of the best locations and also the most preferred property configurations. Some locations are working well today - but if one is investing over a long-term (5-7 years) then it is important to identify the locations which will be the new hotspots 2-3 years down the line. Some of these areas are Bhugaon, Wakad, Wagholi and Manjri. With respect to configurations, it pays to remember that smaller apartments will perennially be in highest demand and will, therefore, sell fastest in Pune. However, one should not focus on compact sizes alone but also on the features offered. Pune is heading rapidly towards a major infrastructure crunch, both in terms of civic and social infrastructure. This means that while good social amenities do exist in the city, they are not evenly distributed - and access to them depends on good connectivity. With new roads being deployed at a snail's pace, the city's future homeowners' access to entertainment and ways to unwind is becoming compromised. They will increasingly depend on the facilities in their own housing projects to help them achieve a good lifestyle quotient. While integrated townships do deliver a good level of lifestyle enrichment, such projects take years to build and progress can easily get stuck for any number of reasons. Smaller housing projects are still the safest bet, but they need to deliver on the lifestyle equation. One should look for projects which come with 180-degree facilities management and a sufficient saturation of lifestyle-oriented features - these have now become an option even for the mid-income group, with such projects being launched in areas like Bhugaon. In the future, such projects are going to become the new standard that every aspiring homebuyer will shoot for. On a final note, it is important to keep a sharp focus on the developer's reputation and credibility. 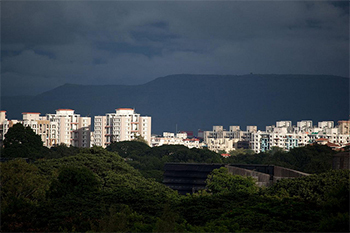 Pune's real estate market is notorious for one-off projects by anonymous developers who have no previous market experience. Such builders buy small plots in the cheaper emerging locations to build cramped little housing projects with almost no amenities and often with low-grade construction materials and faulty design and engineering. Projects by such developers are the worst possible investment bet. One must be sure to patronize only reputed developers who specialize in quality construction and superior amenities.